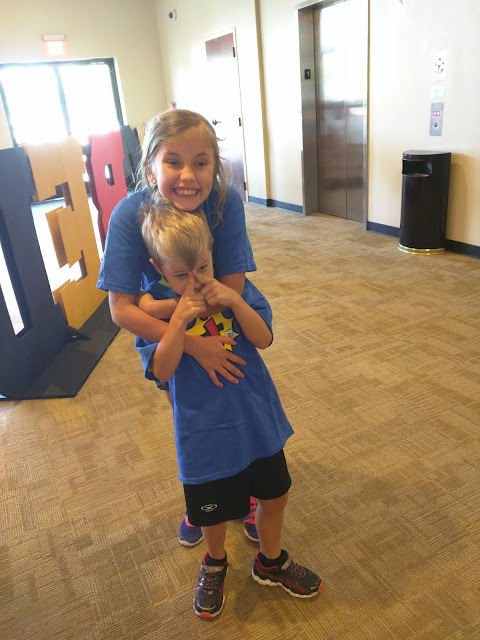 We have been at VBS all week! Our church's vbs is at night and we haven't been getting home until 9:00. My kids usually go to bed at 7:30, they need their sleep. Their behavior has been reflecting their lack of sleep... Henry has even had to take a nap during the day. But the good news is they both love VBS. Henry calls it Funcation Bible School! I have been volunteering in the 5th grade class. I have had the sweetest group of girls. Last night I was moved to a new group because of lack of a leader. The gospel was presented last night, Jesus came down from Heaven in human form to save the world from sin so that everyone who believes in him and claims him can live in heaven. I was almost in tears imagining these words penetrating the hearts and souls of these pre-teens. First question: Is it okay if you keep asking God into your heart and you keep accepting Jesus? Me: Well, It's always good to acknowledge who God is and what he has done for you but when you Become a Christian and you accept Jesus you only have to do that once and then you claim that security. Same girl: But is it okay to keep asking that question to God? Me: When you are serious about asking Jesus into your life you only have to do it once. But it's good to acknowledge who God is and what he has done for you. Same girl: But it is okay to keep asking that question? Next question: How can God see everyone at the same time? Me: Excellent question, God is sovereign. He doesn't work the way you and I do, he is in control of everything, nothing surprises him, he is past, present and future, and because of His power- He can see everything at the same time! Same girl: So he watches us while we are sleeping? Does he sleep? Same girl: He watches you while you are sleeping and he has no need to sleep, remember His Power?! Same girl: : God sounds like a stalker- he watches me all the time! Even when I'm changing? He watches us while we are in the shower? or in the bathroom? Why is God such a stalker? Me: When my kids were younger I found nothing more precious than watching my babies sleep. I would sneak in their rooms and seeing their little sleeping body would bring me so much joy! I promise you that your parents did the same thing! God is our eternal Father, You bring Him so much joy! He delights in watching you grow and sleep! So, that's how my group is going... Also, remember I told you about my first sweet group? Two of the girls asked Jesus to be their Lord and Savior! Tonight is our last night, Y'all can pray for all of us.